Halloween always sneaks up on me. I'm still in the Summer mode of long days and hot weather and trying to get back into the swing of the school routines that Fall brings. This year is no different. HOW is it mid-September with all of it's back-to-school traditions, football, and crunchy leaves? 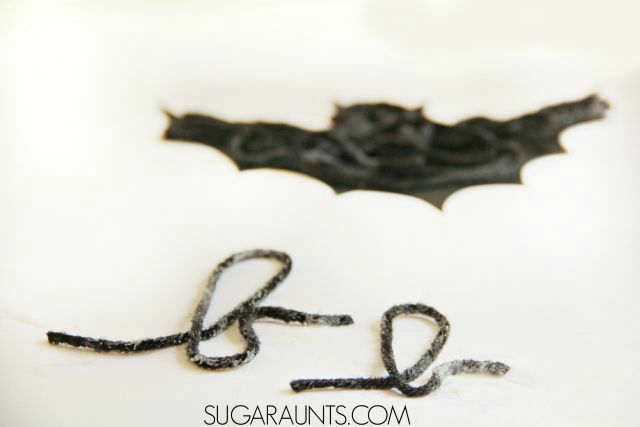 We decided to join a few of our favorite bloggers in sharing a Halloween craft or activity today...and this Halloween bat craft is not helping with my oblivion of approaching colder weather. Even though e now have a few bat crafts in our house, Halloween will still arrive and I'll be scrambling to find costumes and candy! 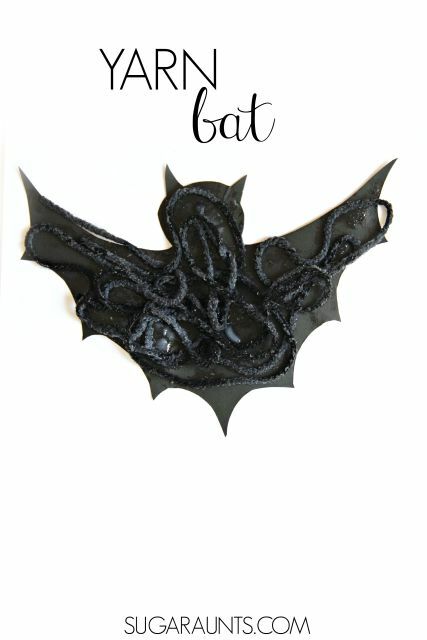 Follow our Halloween Pinterest board . First draw and cut a bat-ish shape on the cardstock. Kids can cut out the shape using their Scissors for great scissor skill work. 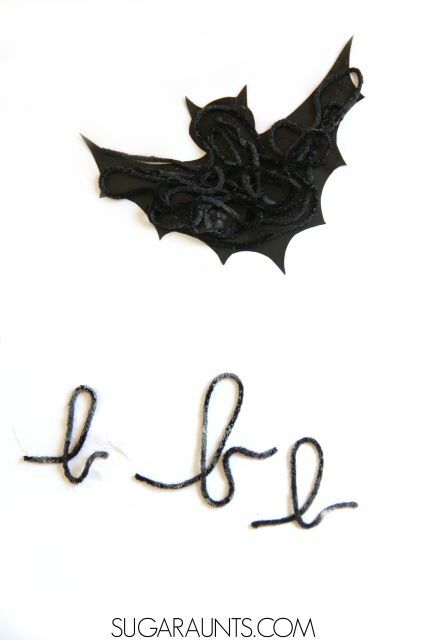 The bat shape is a complex cutting shape and can be done by Elementary aged students. Cutting the angled wings and curves can be difficult, but by using the cardstock, kids will get a bit fore proprioceptive feedback from the thicker resistance of the paper material. To make the task easier, cut wings without the jagged lines or use thicker cutting lines when you draw the bat shape. 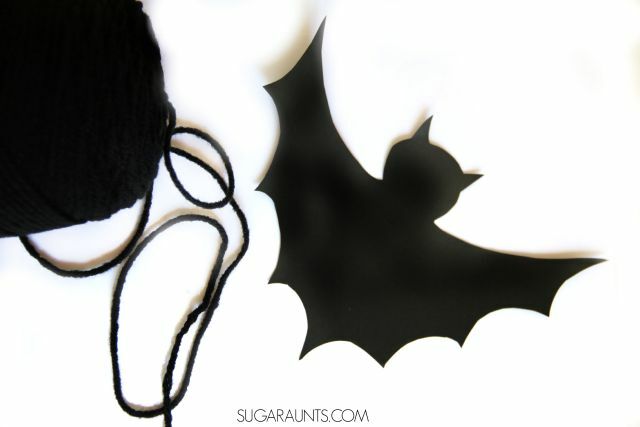 Once you have the bat, you'll need to cut pieces of the black yarn. Have your child cut long or short pieces, it doesn't really matter what length they wish to cut for their bat's texture. Cutting the yarn is a great material to practice appropriate scissor positioning and bilateral hand coordination. If a child is holding the scissors on an angle, cutting the yarn will be more difficult. (You may see them trying to "saw" at the yarn!) Encourage them to hold the scissors strait up and down and the blades of the scissors at a 90 degree angle to the yarn. You can find more of our Scissor Skills activities on our landing page, here. Next, pour some glue into a shallow dish or plate. 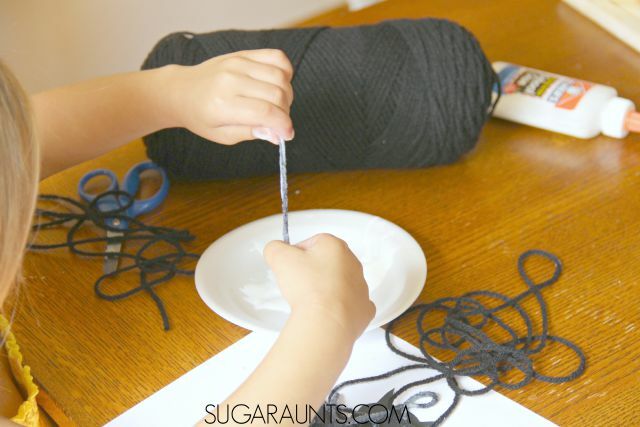 Show your child how to drag the yarn through the glue and get it nice and saturated with the glue. Use both hands to pinch and "scrape" off excess glue from the piece of yarn. Next, drape the black yarn on the bat shape. 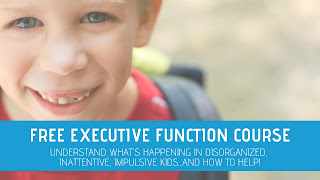 You can let your child get as creative as they wish with this part. Some might like to outline the bat shape and others, just pile it up on the bat. 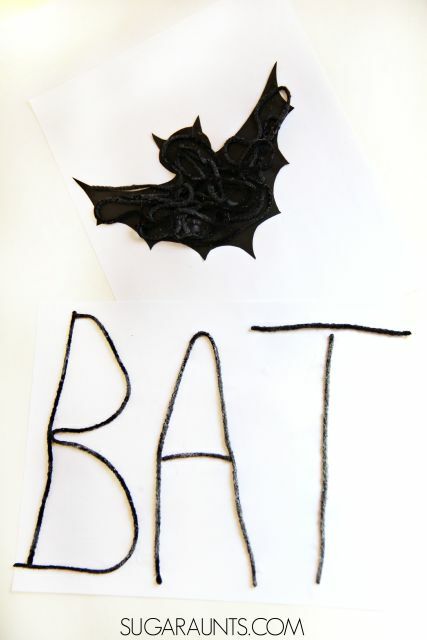 Let the glue and yarn harden and you'll have a textured bat craft to use in Halloween decor this Fall. You will have to wait for the glue to dry, probably overnight. 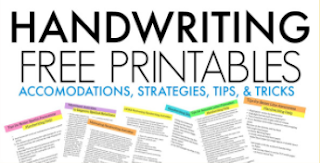 You remember me saying we turned this bat craft into a cursive handwriting exercise, right? Well, we used those saturated yarn pieces to build cursive letters. 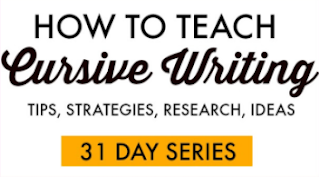 This would be an excellent way to practice cursive letter formation in our Creative Cursive handwriting journal activity. Build printed letters with the glue yarn, too. We had a lot of fun with this Halloween craft and it was a hit with all of my kids...from preschool to Kindergarten, to Second grade (The baby was napping or I'm sure she would have been in on the messy fun, too)!